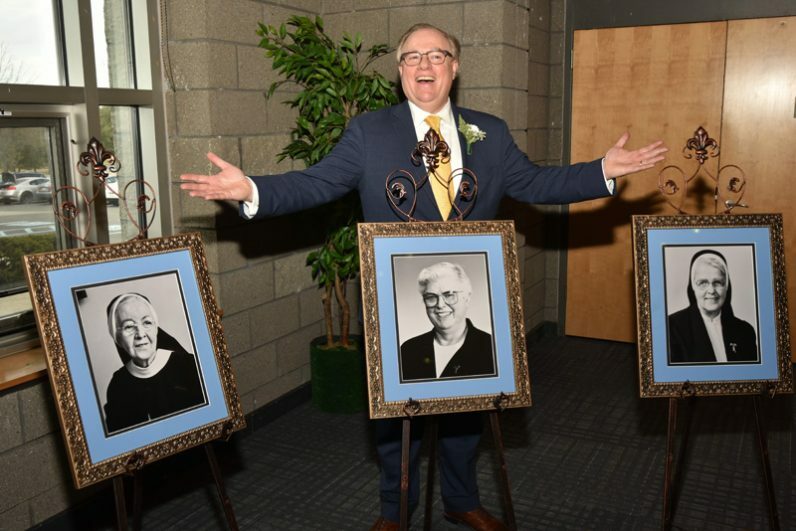 Chris Domes, Neumann University president, unveiled the portraits that will hang in the residence halls. 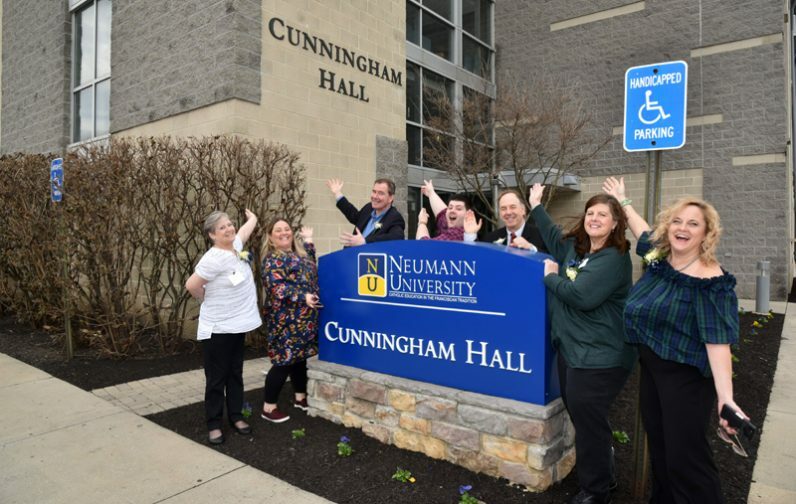 Neumann University recognized its first three presidents by naming residence halls in their honor on March 15, the university’s 54th Charter Day. Previously known as Living and Learning Centers I, II and II, the residence halls were christened Flynn Hall, Cunningham Hall and O’Neill Hall after Mother Everilda Flynn, O.S.F., president from 1965-1970; Sister Madonna Marie Cunningham, O.S.F., president from 1971-1983; and Sister Margarella O’Neill, O.S.F., president from 1983-1989. The first three presidents of Neumann University were Sisters of St. Francis of Philadelphia, the congregation that founded Neumann University (as Our Lady of Angels College) in 1965. Mother Everilda Flynn was a driving force in Neumann’s founding and a champion of the institution in its early years. Documents trace her advocacy for establishing a college in Aston back to 1959. After serving as president, she became a consultant to the president for an additional 22 years. She held a bachelor’s degree from Villanova University and a master’s degree from the Catholic University of America. Sister Madonna Marie Cunningham used her academic expertise (a master’s degree in psychology and a doctorate in clinical psychology from Fordham University) to influence the culture of service at Neumann. Prior to becoming president, she opened Our Lady of Angels Counseling Center. As president, she established the Child Development Center on campus and led enrollment expansion by admitting men in 1980. Sister Margarella O’Neill’s leadership led to the construction of the Bruder Life Center, which houses the Bruder Athletic Center, the Meagher Theatre and the dining hall. Before becoming president, she served as Neumann’s first academic dean and an associate professor of psychology. She earned bachelor’s and master’s degrees in nursing education and a doctorate in sociology from the Catholic University of America. Members of the Cunningham family outside the newly named Cunningham Hall. Franciscan Sister Madonna Marie Cunningham was president of Neumann University from 1971-1983.